Heat the oil in a large heavy skillet over moderately heat until hot but not smoking, then sauté shrimp, turning over once, until just cooked through, about 2 minutes. Add garlic and red pepper flakes to the oil remaining in skillet and cook until fragrant, about 30 seconds. Add wine and cook over high heat, stirring occasionally, for 3 minutes. Stir in freshly chopped basil and tomatoes and season the sauce with salt and freshly ground black pepper, to taste. Return the shrimp to the pan and cook just until heated through. 1841 members have added this recipe to their cookbook. One of my favorite shrimp recipes. Added a squeeze of lemon juice near the end. I added extra tomatoes and served 2 portions and froze the rest for another meal with brown rice. Great recipe! I added asparagus and scallops then served it on cooked rice sticks. Very filling meal and low fat. This was very good. I didn't have any fresh basil so I had to use dried but it was still very good. It was also very easy and quick to make. My husband even liked it! I added mushrooms to this dish and it was great we ate it all. AMAZING! It was light and delicious. We had crab tails instead of shrimp because it was on hand. Can't wait to try it again! 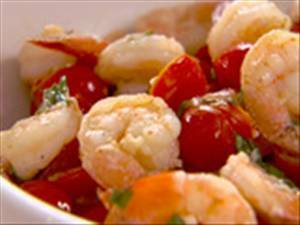 There are 150 calories in 1 serving of Garlic Basil Shrimp. Calorie break-down: 56% fat, 18% carbs, 26% protein.